A northern Indian vegan croquette, a great side dish for any dinner. For the garam marsala: Combine all ingredients. Reserve. For aloo tikki: In a medium bowl, combine all ingredients except oil. Add 1 tablespoon garam marsala, mix until thoroughly combined. Divide mixture into 12 equal-sized portions and form into patties. Heat oil in medium-sized pan and fry patties until golden brown, about 4 minutes on each side. Remove from heat and place on a paper towel-lined plate. For the coriander chutney: Place peanuts, jalapeños, ginger, salt and olive oil into blender. Pulse until smooth. Add cilantro, mint, lemon juice and water to peanut mixture. Pulse until smooth. 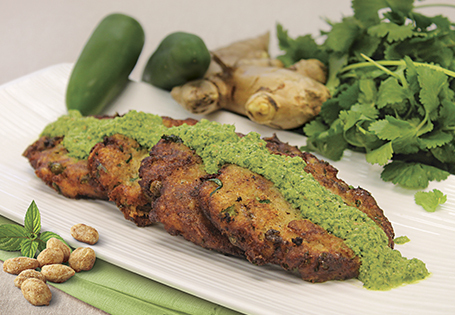 Serve potato patty warm, topped with coriander chutney.